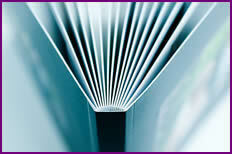 The concept of the Photo Book is about quality, simplicity and value for money. 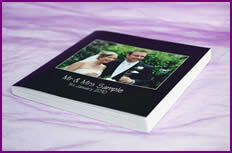 The book is produced using the very latest printing techniques at one of the leading photographic printers in the North West. Our photography, combined with their expertise in high quality printing, results in a beautiful Photo Book of your special day. The Photo Book measure 10 inches x 10 inches with a total of 15 pages (28 sides) each having a heat seal protective front and back cover, allowing 80 photographs to be displayed. 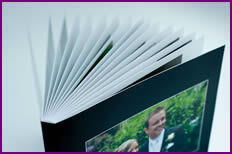 Each fully bound page is approximately 500 grams thick with a semi luster finish giving the perfect platform for your colour or black and white images. £180.00. 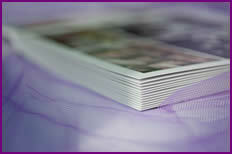 The Photo Book incorporats a relatively simple layout giving the eye instant access to the image. Once you have printed off the "Order Form", all you need to do is write the photo file number of your choice in the chosen frame on the order form. Please note that if the frame layout is landscape ( ) or portrait ( ), then the chosen photo must also be in landscape or portrait. Please see layout example.